Framed by winter-stripped trees, the Rabinowitzes’ modest brick home sits on a quiet street in North Atlanta. Inside it’s warm and comfortable: artwork and family photos dotted around the walls and furniture. Two cats–Mookie and Vito–prowl around the room, swatting at spots of sunshine. Allen Rabinowitz maneuvers out of his chair. “Morning isn’t my best time of day,” he says. Allen sits down at the kitchen table next to his wife Jan, who is clasping a cup of coffee in her hands. The last few months have been difficult, she says, although the hardship doesn’t show on her smooth, unlined face. She’s sixty-three, but looks much younger. That’s down to genes: her mother had the same soft skin. Two years older than his wife, Allen, too, looks younger, although his body tells a different story. He lifts his shirt to reveal surgical scars: two incisions either side of his chest where battery packs sit, part of the deep brain stimulation (DBS) system that keeps shakes and tremors in check. Cables run from his chest, up each side of his neck to the top of his skull, forming two bumps, like horns about to come through. Allen tells the story of his rock ’n roll youth with a frank, unblinking gaze… a side effect of Parkinson’s Disease, he says later. Brooklyn-born and -bred, his love of music writing started in college, eventually leading to career that saw him work as a roadie, band manager and finally, music editor. New York City in seventies and eighties was an exciting place and time for music lovers and Allen had a front-row ticket to the action. He met The Kinks and the Beach Boys’ Dennis Wilson, as well as witnessed the birth of punk. Inevitably, there were a few rock ‘n’ roll adventures, including a memorable stand-off with Patti Smith, Bruce Springsteen and the New York Fire Department during his stint as box office manager at legendary music venue CBGB. Inevitably, there were a few rock ‘n’ roll adventures, including a memorable stand-off with Patti Smith, Bruce Springsteen and the New York Fire Department during his stint as box office manager at – the CBGB Second Avenue Theater, an offshoot of the legendary music venue CBGB. But the good times came to an end. Tired of being broke, living on his uncle’s couch, Allen left New York thirty-eight years ago for a fresh start in Atlanta. He had no connections, but armed with a Brooklyn attitude, he landed the job of his dreams: a gig as the music editor for Atlanta’s Marquee Magazine. “It’s amazing what you can do if you have chutzpah,” he says. It’s amazing what you can do if you have chutzpah. The couple met twenty-eight years ago at a singles night, when, in a story as old as love itself, eyes met across a crowded room. Later, they found themselves in a conversation about dogs. “You were funny,” confirms Allen. “I’m not as funny anymore,” she says. They exchanged details and after a whirlwind romance became engaged, then married. Their son Joey was born a few months later. The next few years of life, work and childrearing passed in a happy blur. The first inkling Allen had that something was wrong came in 1998, watching a baseball game on the television. Allen saw a doctor, who told him it could be anything, so he waited. When his symptoms became worse, he saw a neurologist. The next doctor, a veteran in the field, took just two minutes to confirm the diagnosis. The first couple of years after the diagnosis weren’t too bad. But when Allen’s father died in 2001, the stress sent his symptoms up a notch, and eventually, the disease took over their lives. [Parkinson’s] was like an earthquake going on in my body. “It was like an earthquake going on in my body,” Allen adds. The cocktail of drugs to address Allen’s symptoms came with their own problems. In 2011, Allen elected to have brain surgery to install a Deep Brain Stimulation system, which can help control the most debilitating symptoms of Parkinson’s. During the five-hour operation Jan watched as surgeons drilled holes into her husband’s skull, implanting the electrodes that send electrical impulses to targeted parts of his brain to help motor function. The surgery helped Allen regain a semblance of normal life, although he says Parkinson’s brings a few “wonderful surprises” to keep them on their toes. Insomnia is a constant and unwelcome guest, affecting not just Allen but Jan’s sleep quality too. However, the insomnia had its own unexpected side effect. “One of the weird things about Parkinson’s Disease is that it opens up aspects of creativity,” Allen says. 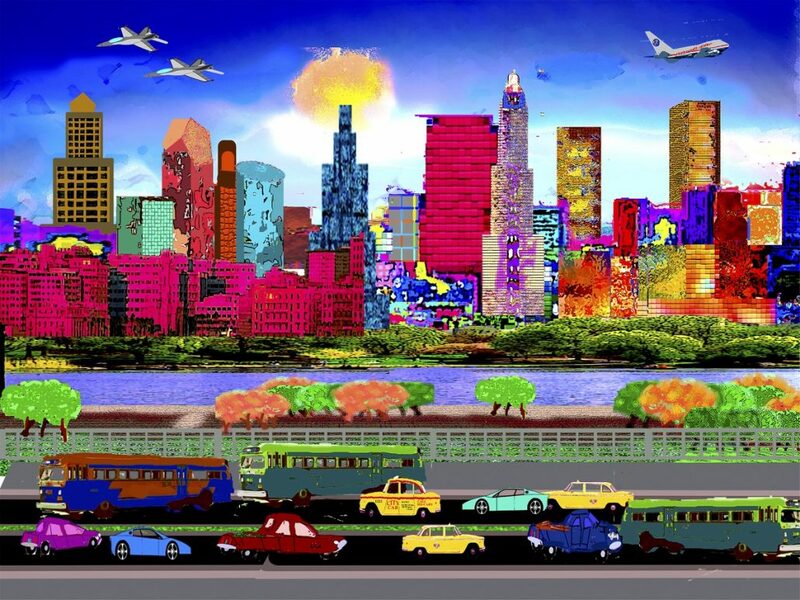 One of the digital artworks Allen has been experimenting with since Parkinson’s. Once, during a three-night run without sleep, he began manipulating images with Photoshop. One of the weird things about Parkinson’s Disease is that it opens up aspects of creativity. Allen leaves the room and returns with four binders, which he places on the table. He leafs through his work, pointing out his favorites. The carefully numbered print-outs feature real and imagined cityscapes, pop-art style images of his music idols, bright crowds of people and rows of yellow taxis. Although the days of nine-to-five are long gone– “work went to hell in a hand basket”– the creativity’s still flowing. Along with his Photoshop art, Allen’s still writing: short stories, and two novels based around his youth in 1960s New York City. Jan is matter-of-fact about the toll caring for Allen has taken on her. Until 2011, she worked in market research. It was a career she loved, but the stress of caring for Allen–as well as other pressures like her elderly mother beginning to need more care–overwhelmed her. She still struggles each day, she says. Jan says Parkinson’s has forced the couple to confront a permanent shift in their relationship dynamic. “One of the reasons I married Allen is because he has always been very protective of me, and he told me he will always take care of me. Unfortunately, he can no longer care for me in the same ways he used to. He takes medication to help him sleep, so he is unable to jump up out of bed and walk around, so if we hear a noise in the middle of the night, I have to check it out. Separating the disease from the man she married is a daily challenge, she says. One of the reasons I married Allen is because he told me he will always take care of me… [but] it just isn’t possible the way it used to be. Jan and Allen don’t talk about this new dynamic, but there is a deep understanding between the couple, Jan says. For a long time Jan struggled on her own, until the chance discovery of a book in the public library. It was called Mainstay by Maggie Strong, and detailed the journey of a woman who had multiple sclerosis. Mainstay mentioned a support group for spouses of carers called the Well Spouse Association. Jan Googled the name and found a chatroom, where she’d post when she couldn’t sleep. In 2005 she went to the Well Spouse conference, and when she came home, she decided to start an Atlanta group. While Allen likes that the group gives Jan an outlet, not everyone feels the same way, she says. Twenty percent of caregivers die before the sick person they’re caring for. As with many others in their situation, money is always at the back of their minds. The state of Georgia doesn’t have provision for caregivers, so the two of them live on Allen’s disability. And they’re bracing themselves for the worst: if the Affordable Healthcare Act is repealed, Jan will likely lose her medical insurance. She’s already made compromises to the detriment of her health care for the sake of cost: switching expensive branded medication for cheaper, less-effective generic brands, while some meds she’s had to give up altogether. And of course, while Allen’s still pretty independent, this will likely change. Recently, he’s developed walking problems. While making a sandwich, he fell and broke his finger. Another day saw him smash the glass in the front door when he couldn’t stop after rounding the corner in the hallway. What will happen when Allen’s care is too much for Jan? 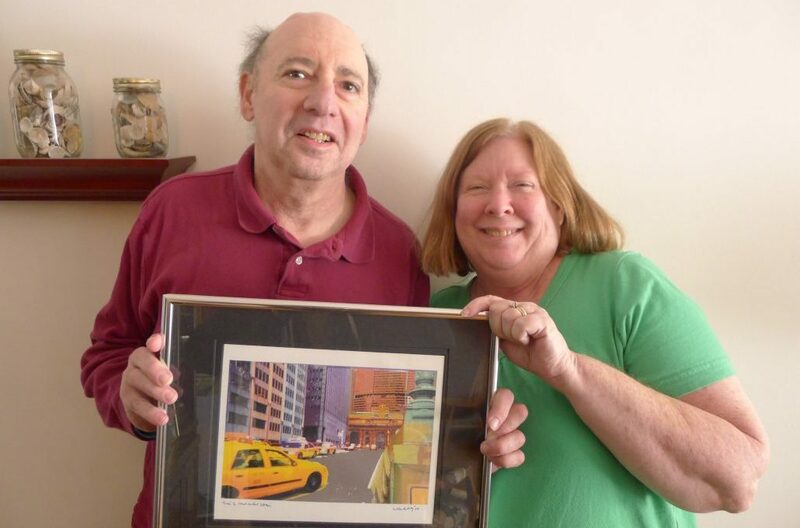 Jan and Allen, posing with one of his artworks. Outside, Jan sighs at the crumbling plant pots by the front door, filled with dry, cracked earth. “I need to do something about these,” she says apologetically. But she doesn’t have the time or the energy for gardening. It’s been difficult explaining the impact of Parkinson’s Disease to family members, they agree. Some have been less than sympathetic.